...Winter that is. The time when the nights draw in and we start to root around the wardrobe looking for warmer things to wear. When this time comes, embrace it - and look for things to do that will help you enjoy the cold weather. I recommend ice skating. Your probably wondering why. 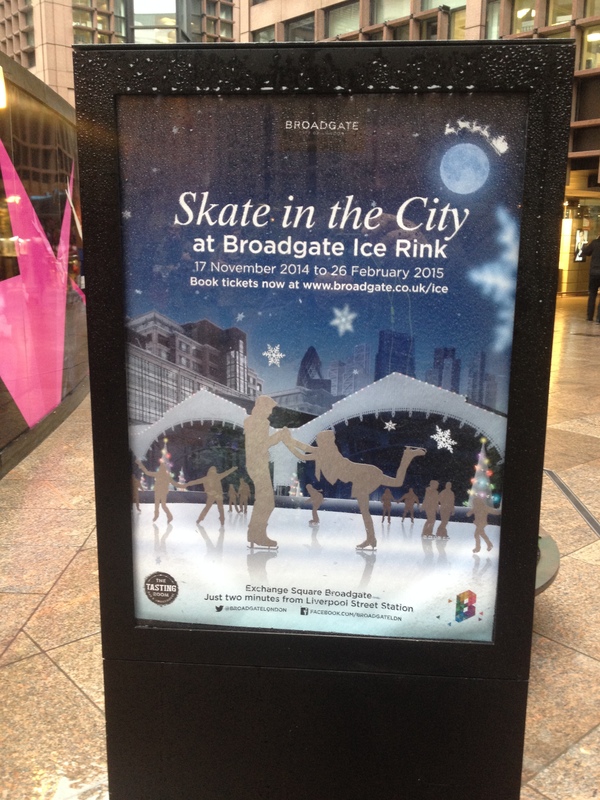 Well, it is floodlit, so you can enjoy the near natural light while you skate, it is energetic, so you'll keep warm, and most of all, whizzing around on ice is fun. The only thing you need to do is find a place to skate - let me recommend one for you - Broadgate Ice Skating Rink. Plus it is in the heart of Broadgate, which is just next to Liverpool St, so perfect for enjoying a bit of shopping, drinking or food within this very fashionable area. Now I know you may have excuses as to not do it - but I can counter those immediately. Can't skate? Don't worry - they provide lessons for those who need them, with the Head Skate Coach having been a coach on ITV's Dancing On Ice programme. Worried you might fall over? Again - not a problem, they have skate aids. Oh, and finally, if you think that by saying you don't have time to go skating you will get out of it - they are open from 10am to 10pm - so you could even go during your lunch break.